Miami fans are pretty familiar with Minnesota-Duluth’s bio. The RedHawks played their last four games of 2015-16 at UMD, facing the Bulldogs in 2015-16’s regular season finale series on the road and returning to Duluth the following weekend for an NCHC Tournament best-of-3 quarterfinal set. Miami didn’t win any of those four games, and its season ended in upstate Minnesota as a result. Minnesota-Duluth goalie Kasimir Kaskisuo (photo by Cathy Lachmann/BoB). Goalie Kasimir Kaskisuo went pro after last season after posting a 1.92 goals-against average, which leaves a major void in net for the Bulldogs, but they should still have a strong returning corps this fall. 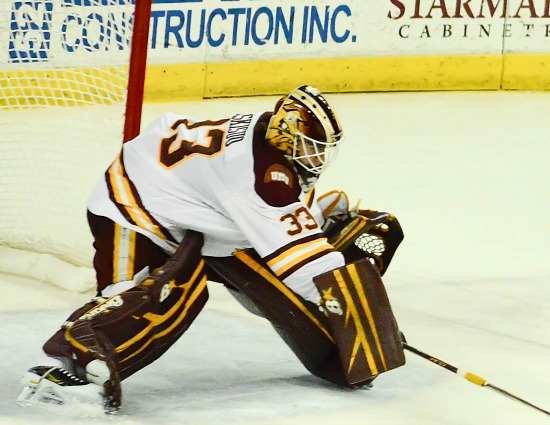 Minn.-Duluth’s success was predicated on defense last season, as the Bulldogs allowed just 82 goals – 2.05 per game – the best in the NCHC, but this team has three freshmen goalies on its roster. COACH: Scott Sandelin (278-265-73, 17th season). 2015-16 RECORD: 19-16-5 (11-10-3 in NCHC, 4th place in the league). 2015-16 POSTSEASON RESULT: Lost to Boston College, 3-2 in the NCAA regional final. RINK (capacity): Amsoil Arena, Duluth, Minn. (6,756). LAST SEASON VS. MIAMI: 5-0-1 including sweep in NCHC quarterfinal series. SCHEDULE VS. MIAMI: In Duluth Feb. 23-24. TOP RETURNING PLAYERS: F Alex Iafallo, F Karson Kuhlman, F Dominic Toninato, D Neal Pionk, D Willie Raskob, D Carson Soucy. KEY NEW FACES: F Joey Anderson, F Riley Tufte, D Jarod Hilderman, D Nick Wolff, G Hunter Miska. NOTES: UMD completely dominated Miami last season, especially when it counted most, but the Bulldogs lost their top two forwards in terms of points (Tony Cameranesi and Austin Farley), top-scoring defenseman (Andrew Welinski) and starting goalie (Kaskisuo). Iafallo finished with eight goals and 15 assists last season, and Toninato went 15-6-21, tying for the team lead in goals. Kuhlman also reached the 20-point mark, potting 12 markers. Tufte was selected in the first round by Dallas. Named Mr. Hockey in Minnesota, he is 6-feet-5 and scored 10 goals in 27 games in the USHL last season. Minnesota-Duluth has a solid, experienced defense corps returning, with six veterans and three freshmen. Back from last season are Pionk (4-13-17), Raskob (2-11-13) and Carson Soucy (3-9-12), all of which played at least 36 games in 2015-16. The Bulldogs’ goaltending situation is their wild card. In addition to Kaskisuo leaving early, their backup – Matt McNeely – was a senior, so like Miami, UMD will be starting fresh(men) in net. Hunter Miska went 32-14 with a 2.46 goals-against average with Dubuque last season. Another Hunter – Hunter Shepard – finished 34-14-1.90 with a .926 save percentage in the NAHL last season. The Bulldogs lost several key players from that regional finalist team, but they have been amazing consistent in the first three years of the NCHC, finishing fourth, fifth and fourth. Despite winning 20 or more games just once in the past four years, Scott Sandelin’s UMD teams have qualified for the NCAAs back-to-back years and came within a goal of a Final Four berth last year. Posted on September 10, 2016, in 2016-17, University of Minnesota-Duluth and tagged 2016-17 nchc snapshot, Minnesota-Duluth Bulldogs. Bookmark the permalink. Leave a comment.